Issue #71, only the third all-fiction issue in 25 years. Okay, this is really sad, and I’m not talking about all the annoying changes WordPress is making. I’m talking about tooting my own horn. Sigh. The following paragraphs in italics are what I started writing 8 months ago. Good God! I’ve been so remiss on my updates here that I’ve neglected to mention the pieces that have come out this year and that I’ve sold. 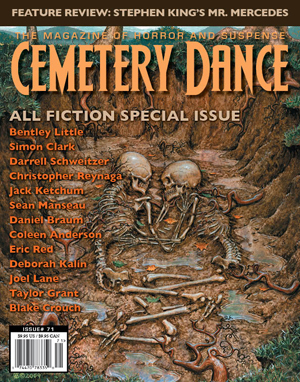 In May, “The Collector” came out in Cemetery Dance magazine. 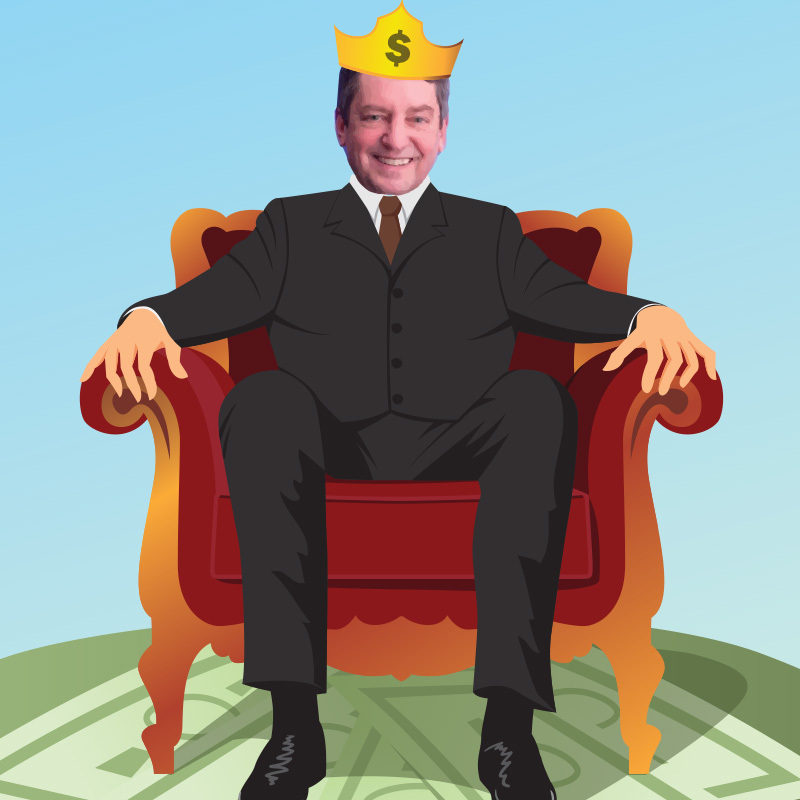 From submission to publication, this story took 6 years. That’s a record but it was worth the wait. Last fall, “Gingerbread People” was published by EDGE Publishing in Chilling Tales 2: In Words Alas Drown I. Unfortunately many magazines and anthologies never get reviewed but there is a short one up at Bitten by Books and Tangent. However, be forewarned that Tangent reviews tend to give summations of the stories as well. So, continuing on from there, just a note that “The Collector” is eligible for a Nebula, Hugo or World Fantasy nomination. Not that that will happen much as I’m still a fairly unknown pea in a pod. I actually had very little published last year. It sometimes happens like that, with sales happening one year and the publication in the next. I did also sell the poem “Family Tree” to They have to Take You in, a book published in Ontario and edited by Ursula Pflug. 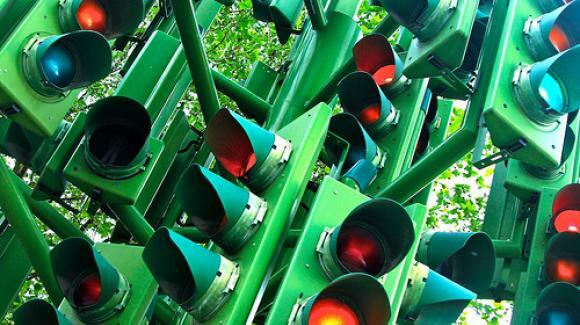 Now, for this year, there is a ton of news! 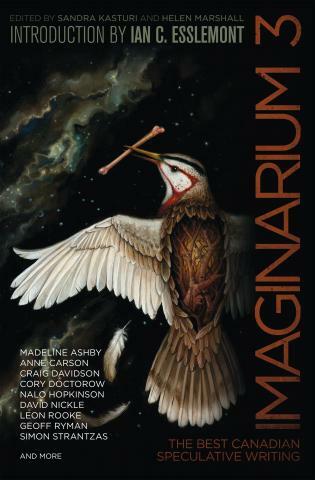 “The Book With No End,” first published in Bibliotheca Fantastica, was reprinted in the current Imaginarium 3: The Best of Canadian Speculative Writing, from CZP. It came out in February, and this month “Pearls and Swine” came out in The Exile Book of New Canadian Noir, editied by David Nickle and Claude Lalumière. Polu Texni has also published another one of my poems, “I Dreamed a World,” which is up and can be read for free. Later this month (I hope) Burning Maiden will be published and I’ll be the feature poet with three poems. It’s from Evil Eye Press. “Sins of the Father” was sold to Our World of Horror, (Eldritch Press) and “Symbiosis” to Shoreline of Infinity, a new online mag out of Scotland. And “Our Lady of Redemption” should be out in Nameless Magazine sometime soon. There are also a couple of articles on monsters. 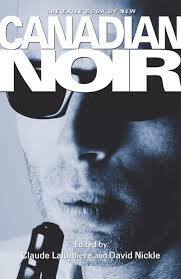 Cover for the Exile Noir book. Available now and a collection of all noir genres. So yes, I’ve been rather busy. And I’m co-editing The Playground of Lost Toys as mentioned a couple of posts ago. On top of that, I’m trying to write 50 new and dark poems by Sept. That’s a lot so I am working on them now. I’m about to send a manuscript and outlines off to an agent to see what will happen there. And in the meantime I’m also working on a few stories. I’ll be taking a good old fashioned blank book with me to Spain to do some old fashioned writing, as well as a tablet. It will be a vacation but writing will be involved. I’m off to my best year for published works so I’ll see what the rest of the year brings. Last summer a friend and I were walking along the beach, off to see an art barge behind the Vancouver Maritime Museum. The barge had wooden staircases and rooms built on it and a little shuttle ferry took you out to it. It was interesting if not fascinating and we noticed that the dock we left from was called the Heritage Harbour. There were about a dozen wooden boats, all with signs indicating their history and construction. Some were sailboats, some fishing trawlers, all relatively small (but what do I know about boats). It was a beautiful summer day so we read the information on each boat, figuring this was where owners of vintage boats could show off and attract additional attention for the Maritime Museum,which houses the Saint Roch, the first boat to sail the NW Passage, complete the sailing in one season and circumnavigate North America. 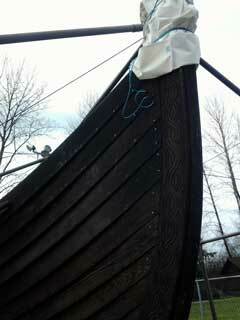 We noticed two women stowing gear for a dark brown Viking longboat. The sails were down but it’s distinctive carved animal heads gave it away. I mentioned that I’d seen it out in the bay a few times. The boat is out for repairs, and the heads are stowed for now but you can see some of the details. It turns out that the ship is named the Munin (after one of Odin’s ravens) and for a donation you can reserve space on the boat for an approximate two-hour sail. That sounded fun, so we signed up. There is an upper and lower limit for sailing the boat as you need enough people to row the boat out of the harbor and not to many that there are no seats. Imagine a giant wooden rowboat and then imagine Leif Erickson sailing one to North America. The Gokstadt was the name of that historical boat and the Munin is a half-size replica at 40 feet long and 20 feet wide. After I went out the first time, I had another group of friends who wanted to go so we went a second time. By the end of that trip, I was hooked and signed up to volunteer. I know nothing about sailing, or rowing for that matter, but I liked that sailing is outdoors, social and true exercise. 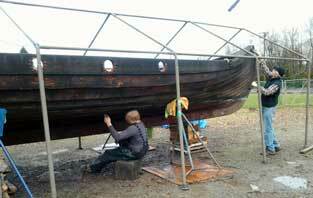 Munin will sail in winter if weather permits and except for the bilge pump it’s all the way it was centuries ago. 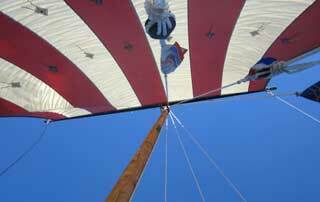 There are 10-foot wooden oars (approximately) and you must row in and out of harbor, then you can put up the sail. Some of the maintenance is check the boards for cracks and scraping the hull. I’m learning the ropes, literally, and very green. I managed to go sailing twice more in the fall, with the last day being quite a challenge. The winds picked up and where the Munin usually goes no faster than 20 knots, I was told we hit 35. We had to row with the sail up just to try to get back to the harbor. As many hands as possible had to row that day. I’m still very new to rowing so my grasp of the oar isn’t very strong. Even my pinkies hurt the next day. The current and wind can grab the oar and slam you out of your seat. I wasn’t the only that got knocked over and we almost lost an oar once or twice. But it was exhilarating. Now, we’ve had to pull the boat for the winter because the moorage is changing but more importantly the boat needs some repairs as it was taking on water. 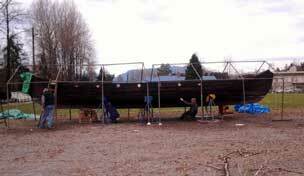 Part of volunteering is committing to the nitty gritty of boat maintenance. We are housing the longship at the Scandinavian Centre, (in Burnaby) where Norway House (one of the five Scandinavian houses) was the original sponsor for the construction of Munin 14 years ago. Even the captains scrape and clean. Everyone who works on the boat or who is crew is a volunteer, giving time for free. Moorage is covered somewhat by people reserving for a ride and donations. But there are many costs. I worked at scraping the old paint off of the boat. 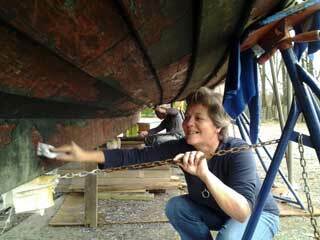 The next stage is replacing the cracked or damaged boards, repairing other pieces, making sure the bilge pump is working, repainting the hull and then re-launching the ship. I learned a valuable lesson; when you’re scraping the hull of a boat, even if it’s been out of water for two months, the wood is still wet and there is wood, paint, dirt and who knows what else flying off. I didn’t have goggles (didn’t even know I should use them) and got debris in my eye. Now I’m dealing with a blocked duct. I’ll be having more adventures once the boat is back in the water. I never knew that I would connect with my Danish & Norwegian heritage this way. In fact, I only knew the family name and the area in Norway where my ancestors came from. Come out and support the Munin and meet the community on March 20. On another note, I saw this ad. You could go to Norway and get a summer job as captain of a Viking sailing ship. Too bad none of our crew is able. Imagine sailing the fjords as the Vikings once did. Here’s to more sailing and who knows what might be next, raiding and pillaging? Fair winds!